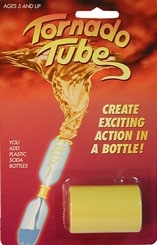 Since its introduction in 1987, the Tornado Tube has become one of the world's most popular soda bottle toys! Use the Tornado Tube to connect two plastic soda bottles like an hourglass, but use water instead of sand. Simply swirl the liquid in the bottles and in seconds a twisting, turning, spiraling vortex appears. For ages 5+.